Echo Park Lake is surrounded by historic structures—graceful Spanish courtyards, Craftsman style apartments, and of course, the Angelus Temple. But few buildings around the lake have as colorful and interesting a past as the tiny house at 1004 Echo Park Avenue. Until recently, little had been known about the one-story structure, which had used for years by the Church of the Foursquare Gospel for shipping and receiving church materials. After months of research, the EPHS determined that the tiny blue house is the original Echo Park Clubhouse, the oldest recreation center building left in Los Angeles, designed nearly a century ago by one of the city’s premiere architects. Constructed in 1908, the Echo Park Clubhouse was only the second recreation building developed by the city’s Playground and Recreation Commission. In those days, there was not just an Echo Park but an Echo Playground that sloped south from Bellevue Avenue south to Temple Street. (Most of the playground was wiped out by the completion of the 101 Freeway in the 1940s, bisecting the children’s play area forever. The Echo Clubhouse, as it was then named, sat on Bellevue Avenue facing the lake. It was designed by Sumner P. Hunt, who went on to design the Southwest Museum and the Pierpont Inn in Ventura. In its earliest years, the clubhouse served as the center of numerous children’s activities, a venue for community lectures and a practice room for the Los Angeles Examiners’ newsboy band. 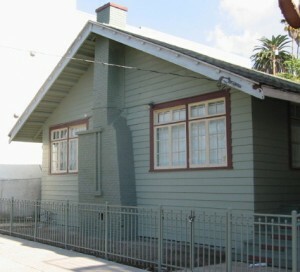 The clubhouse’s main room, 32 by 48 feet in size, housed a library and reading room, and became Echo Park’s first public library. The basement offered a box bowling set and a club room for gymnastics or boxing. Huge May Day celebrations occupied the outdoor playground, and by 1912 the playground had thousands patrons in a single year, some of whom arrived from downtown on the Pacific Electric streetcar that moved up Glendale Boulevard (then known as Lake Shore). By the early 1920s, playground officials decided the neighborhood needed a new clubhouse. Allied Architects — the firm that designed Los Angeles County-USC Medical Center in Lincoln Heights — completed a design in 1924 for a new Spanish-style recreation on Bellevue Avenue, with red-tile roof and elaborate exterior light fixtures. That the clubhouse would be demolished disturbed a prominent Angeleno named Frances “Fanny” Wills, who lived in a Victorian mansion on Fort Hill in downtown Los Angeles (Fort Hill is now the site of the vacated L.A. Unified offices). Fanny Wills was the sister of W. Lemoyne Wills, a well-known USC doctor who was one of the five men who provided land to the city to create the park around Echo Park Lake. Writing to the city, Fanny Wills offered to provide a lot that she owned on Echo Park Avenue so that the building could be used by the Echo Park Mothers Club. The city agreed and on June 2, 1925 the city granted a permit for the building to be moved to the east side of the park. How long the building was used by the Echo Park Mothers Club is unclear; it was eventually acquired by the Angelus Temple, which in turn sold it last year to the St. Paul Episcopal Center.